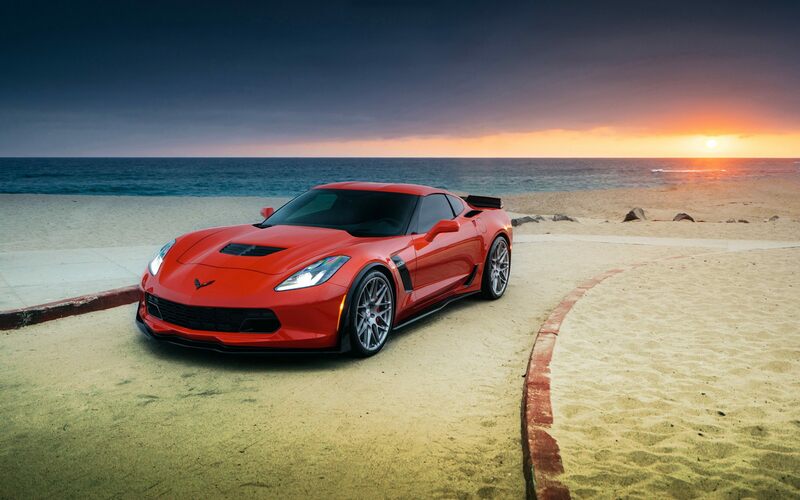 Think of the Corvette Z06 as the most amazing version of a sports car that is already amazing by anyone’s measure. Sold as either a coupe or convertible, the most important feature is its supercharged 6.2-liter V-8 that makes 650 hp and 650 lb-ft. A seven-speed manual is on hand for shifting duties, and an eight-speed automatic transmission with paddle shifters is now available. The Z07 Performance package adds carbon-ceramic brakes, Michelin Pilot Sport Cups, and adjustable aero bits. The Z06 is a formidable beast no matter which form it takes, as there’s essentially no fall-off in performance from coupe to convertible. Chopping the roof from the Z06 results in no palpable difference in rigidity—there’s next to no shake in the cowl or the windshield header—and the weight penalty is less than 90 pounds. Yet perhaps the biggest benefit to the convertible is that it allows pure, unfiltered access to an exhaust note that sounds like a Napalm Death concert being held inside a howitzer. Punch the throttle and your first thought is something like, “Great holy [CENSORED] balls of [CENSORED], this thing is brutal.” The 650-hp, 650-lb-ft supercharged V-8 slingshots the Z06 to 60 mph from a rest in 3.3 seconds. The car reaches 150 mph in 17.7 seconds. It scorches a quarter-mile run in 11.4 seconds at 127 mph. These figures are essentially identical to those we’ve gathered from manual-transmission Z06 coupes.